My current apartment got a fairly narrow kitchen, so when I moved in I begun thinking of how to put a kitchen table in there, someplace to eat, without blocking off half the room. After throwing away many ideas I picked up a kitchen table top, six brackets, a set of mirrors and a series of spots from IKEA and a fiber board, wooden strips at the hardware store. 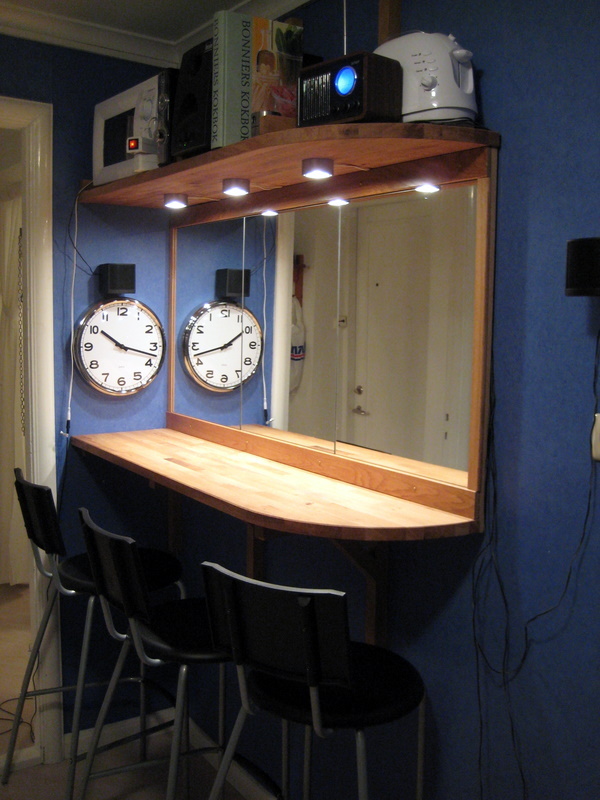 To this I use three bar stools also from IKEA, and actually the wall clock and timer as well. I started by getting the table top sawed in half. 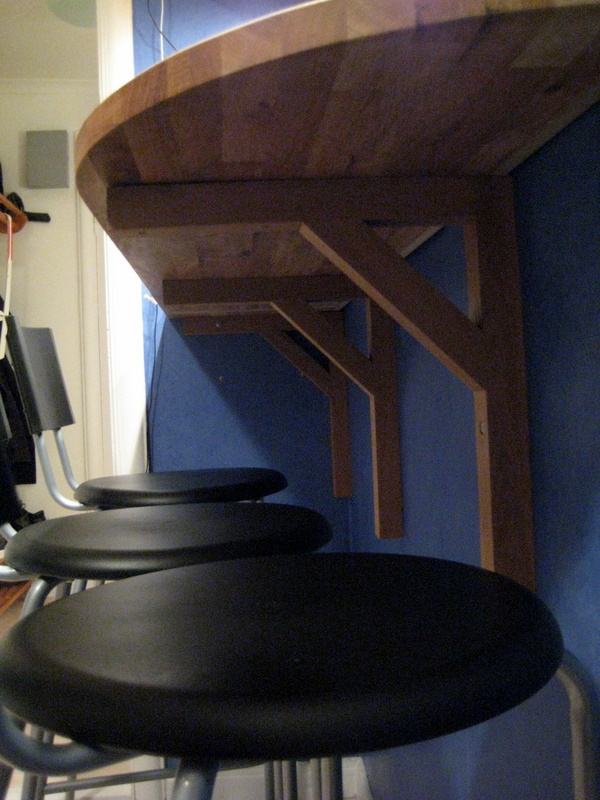 Something we had missed was that the table top had ridges on the underside, but we filled those with putty, and since we mounted everything I have not noticed them a single time. 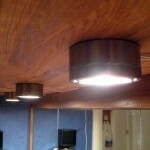 Me and my father prepared the top half by mounting the spots (required some drilling). We first attached a bracket to the corner, where it was screwed into the side wall as well. 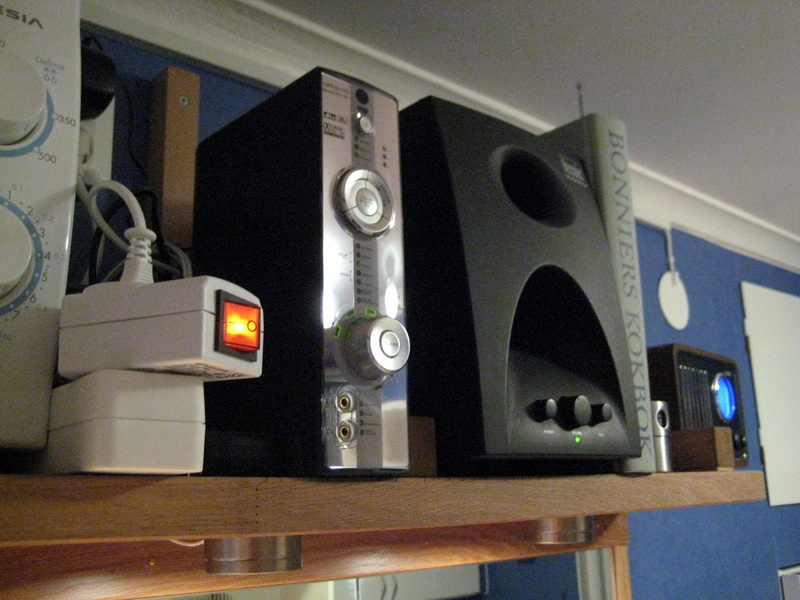 Then we fused a fiber board to the bottom half of the table top and mounted all that to the wall, resting on top of the bracket. More brackets were added. 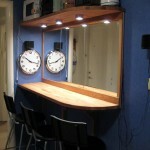 The fiber board was required as the wall was not entirely flat, and we needed a flat surface to put the mirrors on. We put the top half of the table top on top of the fiber board (lots of top there! 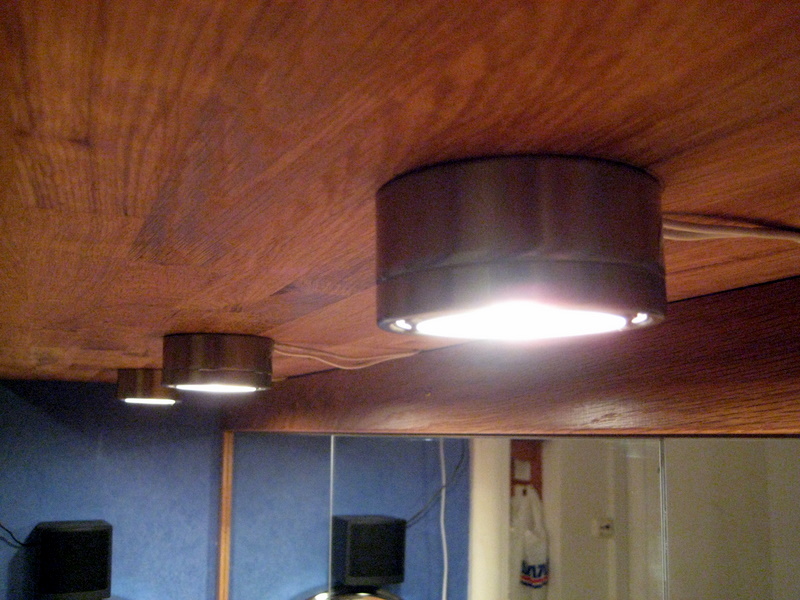 ), like a shelve with the brackets on the wrong side, and then screwed wooden strips to the fiber board before mounting the mirrors with double-sided wide adhesive tape. The description might make more sense if you check out the images below. 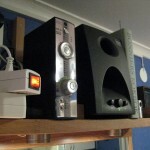 I use the top shelve for electronics, like the microwave oven, receiver, old 5.1 system, toaster and radio. Some people that visit me thinks it is really freaky if you meet their eyes in the mirrors instead of person to person when we eat, which can be fun… but it does indeed feel a bit weird! 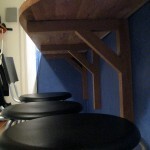 This entry was posted in Projects and tagged Furnishing, Hacking, IKEA, IRL, Photos. Bookmark the permalink.